The Friends email account is down at the moment, and rather than wait for it to get online again, I thought I’d send out race recaps from my own Dartmouth account. We’re getting towards the business end of the racing season now. With the Eastern Sprints just two weeks away for the men’s crews and three weeks away for the women, and with IRA and NCAA qualification up for grabs at those regattas, it’s crunch time for your Dartmouth crews. Race recaps follow a preview of this weekend’s racing below. The HEAVYWEIGHTS have a busy weekend ahead. The varsity and second varsity will head to Alsip, IL (about 40 minutes south of Chicago) for Cochrane Cup racing against defending national champions and #1-ranked Wisconsin and resurgent and #10-ranked MIT on Saturday morning, and a dual race against #14-ranked George Washington on Saturday afternoon. The Chicago Southland Convention and Visitors Bureau is making a pretty big deal of the regatta and has published race times, directions, and spectator information here:http://www.visitchicagosouthland.com/2009CochraneCup.html. The freshmen will travel to Boston, where Coach Kratochvil and I have arranged for them to jump into the dual race between top-ranked Harvard and #9 Northeastern. Their race on the Charles River Basin will start at 8:36 a.m. The WOMEN, who may be single-handedly keeping the Premier Bus Company in the black, hit the road again this weekend to face #12 Cornell. Racing starts at 8:40 a.m. The LIGHTWEIGHTS wrapped up their dual racing season against Cornell last weekend and have an off weekend before Sprints. “Four races into the season, one thing is clear. When this program starts to win cup races, it’s going to win a lot of them. Over the past three weeks, we’ve raced Yale tight and BU tighter than we should have. Lining up against third-ranked Brown, Dartmouth was an undersized, underpowered crew racing into a headwind. And over the past few weeks, we were a crew that had problems off the line. But on Saturday, the guys traded cadence on their high strokes for speed and efficiency. The result was that they stayed tight with Brown through start and hit their base three or four seats down. “Brown pressed out to a half-length through the 500 and took an early push that gained them another half-length. Our guys responded to halt their advance, and the margin stayed within a few seats of a length into the third 500. Shortly after a second push put Dartmouth back to a closed length with about 800 to go, the headwind increased and the effects of a front-end loaded race began to show. Brown moved slowly but steadily away, gaining a length of open at 500 to go and then almost another length in the final quarter. “The freshmen had race similar to the varsity’s, though the margin was tighter. Our frosh were roughly level with Brown through the opening quarter of the race, and while Brown used a strong middle thousand to put a length into our guys, they weren’t able to break the frosh, finishing with a little over a length ahead. “The 1V is three quarters of the way to putting together a full two thousand meters at max speed. This week we focused on better execution in the second 500 and improving our finishing sprint. True to plan, the crew really shined in those strokes, but the third 500 was weak and we gave up valuable ground to Princeton there. I was excited that at points in the race we showed that we can match and exceed Princeton's speed. For each of our races so far, we've had moments of brilliance. We're working on having confidence in our speed and our ability to maintain it for a full 2000m. "This weekend's race was one of my most exciting this season. In the 2V, we had a close race with both Princeton and Penn. All crews learned their lesson last week against Radcliffe and definitely attacked the races more aggressively. While it was disappointing to not catch the Tigers, it's exciting to see that the league overall is getting tighter. It was good to have Penn pose more of a threat this year. They were healthy competition for all our crews. We're getting closer to the top of the pack. If we really want it, we just have to push ourselves a little harder. “The lightweights saw a disappointing day on Lake Cayuga, racing defending National Champions Cornell. The Freshmen 8+ saw the closest racing of the day as the crews got off the line even. Cornell pushed out just before the 1000m mark and held the advantage through the two turns. The freshmen made a last push in the last few strokes, but fell short. Cornell won the event and the Miller Cup in 6:02.2 with Dartmouth crossing the line in 6:06.8. “The 2nd Varsity got off to a fast start ahead of Cornell, but the Big Red found a stronger rhythm during the body of the race allowing them to finish ahead in a time of 6:02.7 with Dartmouth following in 6:16.4. “The Baggaley Bowl race was contested with the Varsity race. The Green got off to a blistering start, leading Cornell by nearly a length. Cornell began to gain momentum when both crews shifted to their base rate. By the 750 meter down mark, Cornell took the lead and pushed out to open water. Dartmouth took one last move to get themselves back into the race and closed in on Cornell but it was too late as Cornell retained the Baggaley Bowl for a second straight year. Cornell crossed in a time of 5:59.3 with Dartmouth finishing eight seconds back in a time of 6:07.6. 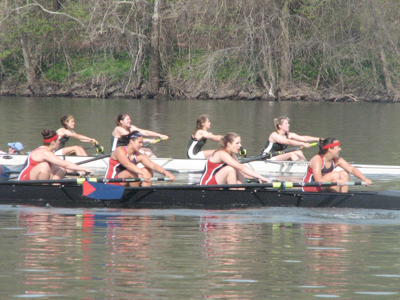 “The 3rd Varsity 4+ & 2nd Freshmen 8+'s found themselves in the mix for the first half of the race. Cornell in both races then established a lead and Dartmouth fell off the pace as Cornell pushed out to open water victories in both races.